Last year, 2013, was a very good year for me. Although it will be hard to beat I’m hoping for an even better 2014! 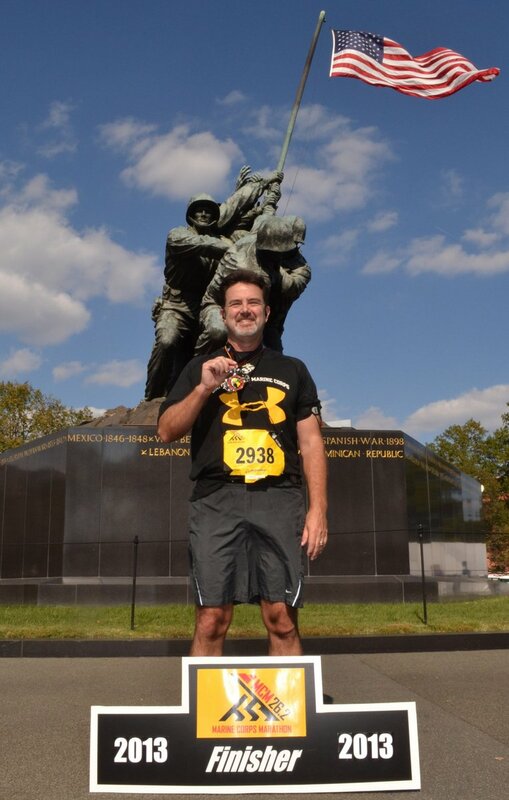 In 2013 I checked a major accomplishment off on my Bucket List, I ran the Marine Corps Marathon and had a great time in Washington DC that weekend! In order to make that happen I ran over 500 training miles including two half marathons, the San Diego Half Marathon in March 2013, and the Rock and Roll Half Marathon in San Diego in June. We had a great time camping near Kings Canyon and Sequoia National Park with family. Although I’ve been many times, this was my first trip to Idaho with Jenny. We spent our first anniversary enjoying downtown Boise, went white water rafting, and biked the Boise green belt on the 4th of July, then headed north for a couple days in beautiful Stanley Idaho. For my birthday we had a terrific weekend on Santa Catalina Island. the trip started out fast with my first zipline experience, and we also had a terrific time hiking in the hills around Avalon and just relaxing in our hotel and at the Descanso Beach club. We enjoyed our third year of Green Flash Concerts at Birch Aquarium and lots of other live music including a few of my favorites Sara Barelles and One Republic at the SDSU Open Air Theater, John Mayer and Phillip Phillips at Sleep Train Amphitheater, Steve Miller at the fair, and Fleetwood Mac at one of my favorite venues – the Hollywood Bowl. We closed on our new house on 31 December 2012, so we had all of 2013 to get settled in. This inspired me to start a new category for my blog: Weekend Project. Although I got a good start on the house, there are plenty more projects to tackle over the next few years. For 2014 I will do this a little differently than last year with a top 10 count down of predictions for 2014! 10. Week-end project – install surround sound speakers! 9. Develop an Android App and publish it to Google Play. 8. Weekend Project – Improve the storage in our garage so we can park 2 cars in the garage at once (novel idea)! 7. Our 4th consecutive season of Green Flash Concerts at the Birch Aquarium. 6. Bucket List (progress) – Complete at least 35 new (never been on hikes) in San Diego County. 5. Bucket List – Walk across the Grand Canyon not once but twice on a rim to rim to rim hike! 3. Visit family and friends in Iowa, Nebraska, Idaho, and even here in California! 1. Bucket List – rock a grandchild to sleep in my arms! I hope your 2013 was unbelievable, and your 2014 is unstoppable! Happy New Year! I started very early planning to run the Marine Corps Marathon in 2013 in March 2012 after putting this on my Bucket List. This would be my first and possibly my only marathon. If there would only be one, I wanted it to be the Marine Corps Marathon. I ran 3 half marathons in 2012 and 2013 to get my training started, and to see what it felt like to run a long run/race. So the morning of 27 October was the culminating event, but the experience really lasted for more than a year and a half. During that time I ran hundreds of miles in some beautiful places. Most of my training was alone, but my son, who ran the marathon with me, ran a couple shorter training runs and most of the long training runs with me. All in all this was one of the most rewarding things I’ve ever done! I have mixed feelings now that I’ve run and completed the marathon. I’m completely satisfied with “the accomplishment” part of it, the memories will be with me for the rest of my life, but I’ll miss having the goal in front of me. I’m glad I can just rest and relax for a few weeks or more without worry, but there is a surreal feeling of something not being right. Does this mean I will have to run another marathon? I don’t think “I have to”, but I may decide I want to at some point. I know I will run more half marathons, but I may or may not do another full marathon. If I chose to never run another one, it will not be because I didn’t love the experience, or because it was so brutal that I never want to do another one, it will be because the training takes a commitment of time that can turn you in to a one trick pony. There are so many other things I want to do. 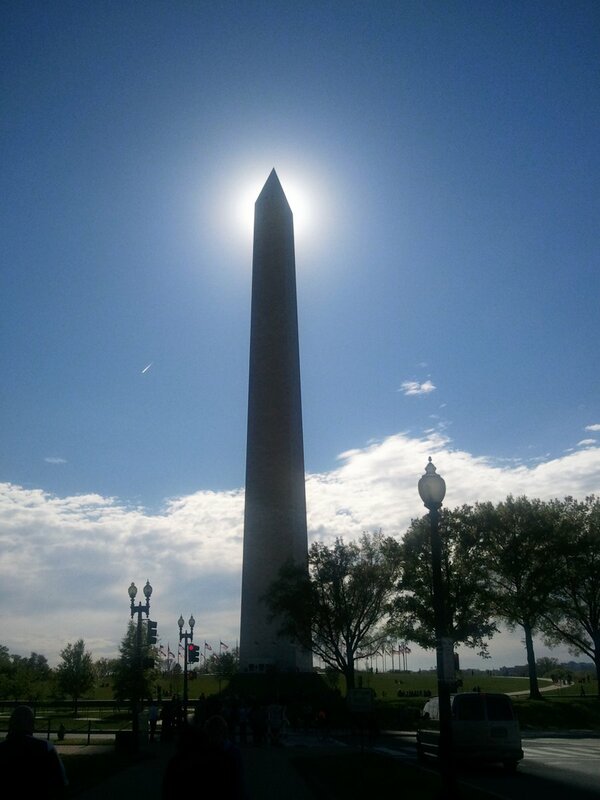 We arrived in Washington DC on Friday in the late afternoon. This gave us a full day on Saturday to get past the jet lag and to do a few things in DC. We didn’t leave until late in the day on Monday, so there was a little more time Monday to check out some memorials and stretch the legs out. For Saturday we had a short list of things “we had to do”. First was getting our bibs and packets at the DC Armory, this was very organized, but also very busy. The line was long for the bibs, but moved quickly. The line was a bit of a bottle neck even though it was moving quickly. Once we got inside the tent, there were very few runners inside the tent. Many of the volunteers had no one in front of them. They could have pushed people into the tent more quickly. We spent about 45 minutes in line and once inside the tent it took about 2 minutes to get our bib. Since I’m a retired Marine we were able to take advantage of a shorter “Military only” line into the Expo. Security was pretty thorough or the lines would have been shorter going into the Expo. Inside we got our race shirt and a clear gear bag we could use to check stuff before the race. Since my wife planned to go with us to the start of the race, we would be able to avoid checking gear. We got out of the Expo quite a bit later than we expected, so we just had time for a quick visit to the Smithsonian and then headed out for an early pasta dinner. The instructions for the race said we should try to arrive 2 hours early. That seemed excessive since we would be riding the Metro, so we planned to leave about 90 minutes before the race. I expected it would take about 20 minutes to get there. In fact it was much longer. Luckily we were not trying to get on the Metro at a really busy station. I think a lot of people trying to get on the train at the Rosslyn Station were unable to get to the race on time. 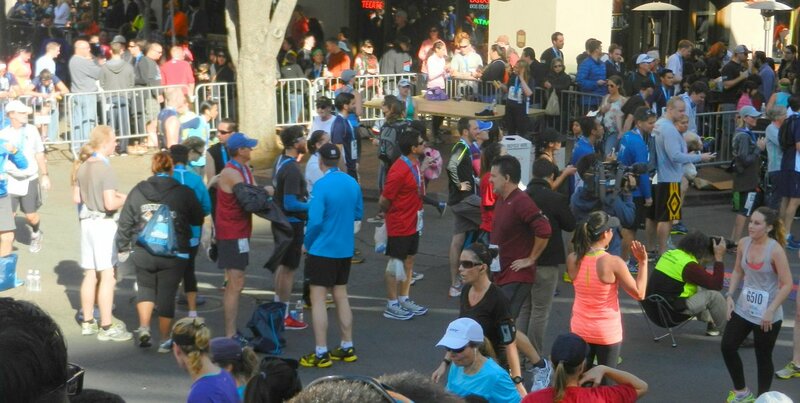 By the time we arrived at the Porta Potties near the start of the race, the start was in 20 minutes! The lines were very long and only some scrambling to find better lines got all the pre-race business done in time! But we managed to watch the pre-race parachute show, take off our warm clothes, and get to the starting line before the cannon fired. There was a mass of discarded clothing at the start in the center median of the road. I suppose they will pick this stuff up for donating after the race. Our corral walked slowly up to the starting point, then we were off. I had expected that my right hip would still be stiff. I had injured it on a training run about 3 weeks before the race and had not run without pain and stiffness since then. It was stiff and painful at the start, but I was able to limp out to a reasonable 10:30 minute/mile pace that I would manage to hold on to for about the first 15 kilometers. The course was mostly flat, but there was a fairly decent climb near the start on Lee Highway into Rosslyn. Then the course turned back toward DC with a long downhill stretch to the Key Bridge. The crowds in Georgetown were very supportive. Then we turned on to Potomac Parkway for a long out and back stretch. This was one of two very “park-like” stretches of the run. My 26.2 Miles of Music playlist was working like a charm! Even though my hip was bothering me, the miles seemed to melt away one song at a time. The Kennedy Center, just before the 10 mile mark was the first DC landmark that I recognized. Then came the back of the Lincoln Memorial. This was where I thought I might see my wife and daughter-in-law in the crowd. I didn’t see them, but they saw me. Although I was starting to feel a bit looser, I was still limping fairly noticeably. My wife told me later she was really worried when she saw me that I would not finish. Somewhere around mile 11 the hip pain finally faded – probably just went numb. The course then passed the Jefferson Memorial, as it would a total of 3 times. I also thought my wife might be there, but she wasn’t. We entered a second “park like” stretch, in this case it was an actual park – West Potomac Park. I passed a couple of porta potties with terrible lines, but finally gave in to “the need” and stopped at a bathroom in the park. The women’s lines were really long, but the men’s line was reasonable. A couple of women must have noticed that because they decided they could endure the use of the men’s room. This little stop cost me 8-10 minutes, but the next 14 miles of the run were much more comfortable! Definitely worth the stop. Before we got to the half-way point they had what I’ll call the “simulated finish line” painted on the ground. It makes for a good picture, and I’m sure I looked better around mile 12 than I did at mile 26.2! The part of the race between 12 and 20 miles was the most enjoyable to me. The course was beautiful, and I felt pretty good. My pace was slow, but I wasn’t worried about that anymore. When the route swung back by the Mall near the Lincoln Memorial, at about mile 16, I finally saw my wife and daughter-in-law. The limp was gone and I was feeling much better. I was very happy to see them. I gave my wife a hug, then back to running! My wife told me later she was very relieved to see me smiling and running more smoothly. The Mall in Washington DC is one of my favorite places, and I rarely visit DC without taking a run on the Mall. So the course between mile 15 and mile 20 was familiar and motivating! 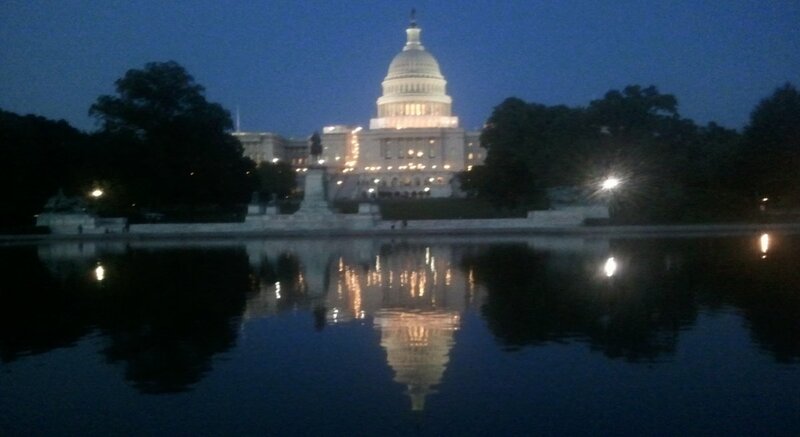 I even got a bit emotional as I turned the corner in front of the Capitol building. The first few times I ran on the Mall you could run up those stairs. I also remember a very rainy day with the family many years ago when we sheltered in an alcove on the side of the Capitol building. Now you can’t come close to the building, but it is still a familiar, yet awe-inspiring sight. As the course turned away from the Capitol we had to run through a gauntlet of photographers. I had a ton of pictures from that part of the course to choose from. Here are a couple of my favorites. After the Capitol we past the 18 mile marker. I still felt pretty good. I remembered my long training runs and the thought on those runs at 18 miles… “will I be able to run 8 more miles”. Today that question would be answered. The miles did seem to get longer after this point. The 20 mile marker was just before the 14th Street Bridge and the crossing back into Virginia. At that point not only did the miles seem longer, but the pavement seemed harder! I didn’t even think about stopping, but I did start thinking about and hoping for the finish! The run through Crystal City was a long blur. Although I usually stay there when I visit DC, most of it did not seem familiar. I did recognize some of it though and I was very happy when I realized we were getting closer to the Pentagon. I didn’t see any mile markers between the 20 and the 25 mile point. This may have just been inattention, but it was actually a good thing. I just ran with no sense of how far I had to go until it was just about over. 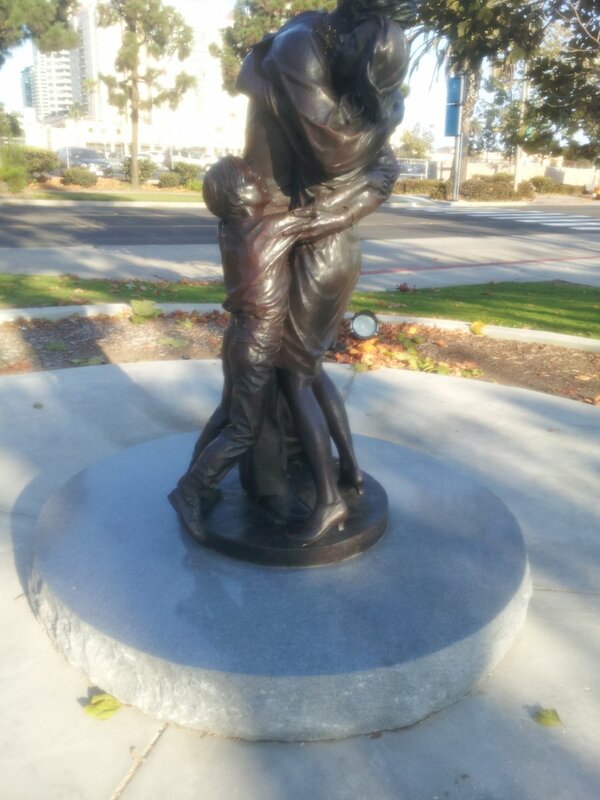 By the time I got to the hill up to the Marine Corps Memorial I was feeling every step. I ran as hard as I could about two-thirds of the way up the hill, then put my hands on my hips and walked up the rest. At the top of the hill I turned right toward the finish line and started to run again. I wasn’t going fast, but I wanted to run across the finish. It was a long tenth of a mile! At that point the race organization kicked in again. They pushed us into multiple chutes to get our finisher medal, a picture with our finisher medal, and all the other goodies. 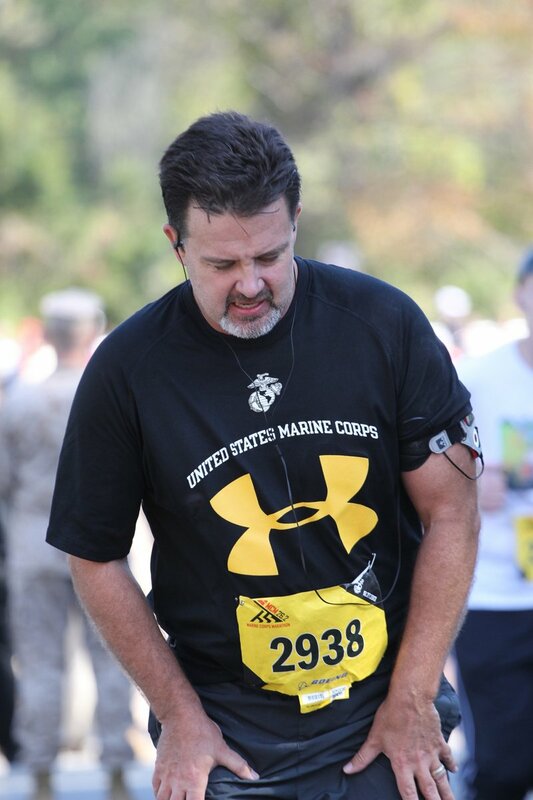 An optional picture was available by the Marine Corps Memorial… but this picture was one of the reasons I chose this race. After the race I was sore, the walk through Rosslyn to get a ride back to the hotel was torture. Although we had planned to ride the Metro back to the hotel, there was a very long line just to get into the station, so we decided to get away from the crowd and try to get a taxi. The first taxi we saw seemed uninterested in working, not sure what his deal was, so my son used his Uber app to get us a ride. The driver showed up in about 5 minutes and we were much more comfortable riding in the large Lincoln Navigator than we would have been in a small taxi anyway! 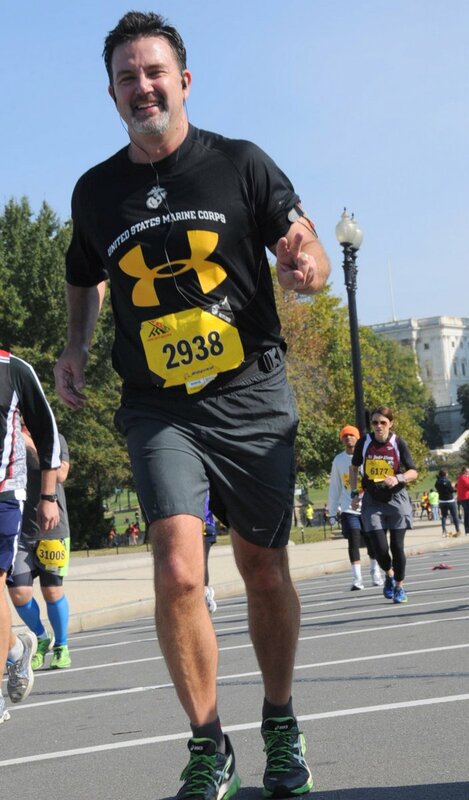 Running the Marine Corps marathon was an amazing experience from the first training run to crossing the finish line! I’m so glad I decided to run a marathon despite being past the age to “do those kind of things”. I’m also glad I chose the Marine Corps Marathon. Although signing up was a nightmare (thankfully they are going to a lottery for 2014), the rest of the marathon operated like a well oiled machine! I can’t imagine a more motivating course and the weather was PERFECT! If I run another marathon it will likely be something closer to home, but I will never forget this experience. It was worth every mile of training, every hour of commitment, and every ache and pain. 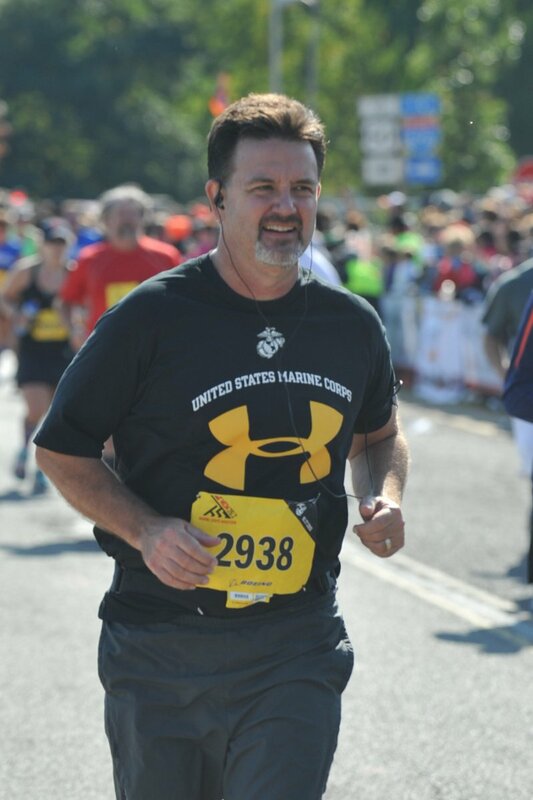 All my Marine Corp Marathon Posts are listed on my Marine Corps Marathon 2013 Posts (Including training half marathons)page. I’ve put in a lot of miles (hundreds), since I had the thought of creating a playlist to motivate me during the Marine Corps Marathon. This Saturday my run will put me over 500 running miles in the last 8 months. All of those miles have given me some additional perspective on what type of music works to get me going, to help me keep rolling along, and to keep going when I feel like stopping. With the long runs I’ve done in the last month or so, I’ve also got a better idea of when I’ll be at those different points. At this point I expect everything past 18 miles to be in the “keep me going” part of the playlist! So what “gets me going”? If I’m running 5-6 miles, I can throw on some Aerosmith and AC/DC and that will get me moving, but when I’m facing a 26.2 mile run, I’ll need some of that, but I’ll also need some much more subtle “get going music”. The rolling along stuff is all about the rhythm and the beat of the music. The keep me going music has to touch the part of me that motivates me to run in the first place, and the part of me that seek challenges and just refuses to give up. I hope to finish in under 4:30, but I better give myself some cushion. I figure that an hour should be plenty. I started by sorting through my digital music and picking upbeat, inspirational, or meaningful music. After the first cut I was up to 9 hours and 40 minutes of music… way too much. Cutting was actually harder than adding the songs to begin with. This was partly because I love all these songs, and partly because I’m not sure what will keep me going past 18 miles yet. Someone Like You (One Fine Day Soundtrack) – Shawn Colvin – Update: I actually finished around here, but only because I listened to some songs twice! Now I just have to hope that me and my IPOD battery last this long! I’ll be trying this playlist out on the next two long runs to see how well it works. If there are any changes I’ll post an update. When I’m running with my son I don’t usually listen to music until after the halfway point, but I think we need to run our own pace for the next couple runs to get the most out of the training and work out what pace we want to run. We each need to try out our own strategies and we are running out of time. 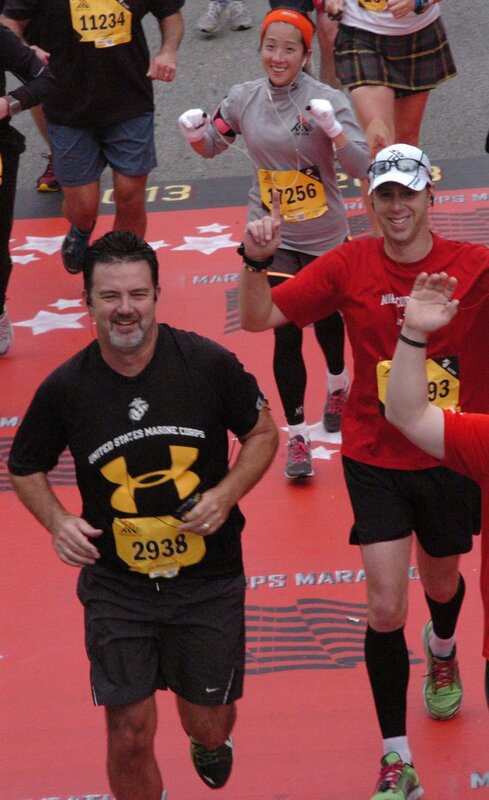 There are 5 more training weekends before the 2013 Marine Corps Marathon. I’m a little behind on my training, due to vacation not injury. which I guess is better. I had planned to have 3 long runs over 20 miles, in my previous post on my training plan – Marine Corps Marathon Training Plan (Over 50, Over Trained, and “A Little” Over Weight. Now, if I push my progressive increases to 2 miles more each weekend instead of 1, I will have just 2 runs over 20 miles before starting my taper. However, I have been able to run about 44 more total miles than the original plan up to this point, even with a two weekend vacation from progressive long runs. This is mostly because I also took about 4 weeks off long runs before starting training, allowing myself to heal and lose most of the soreness. 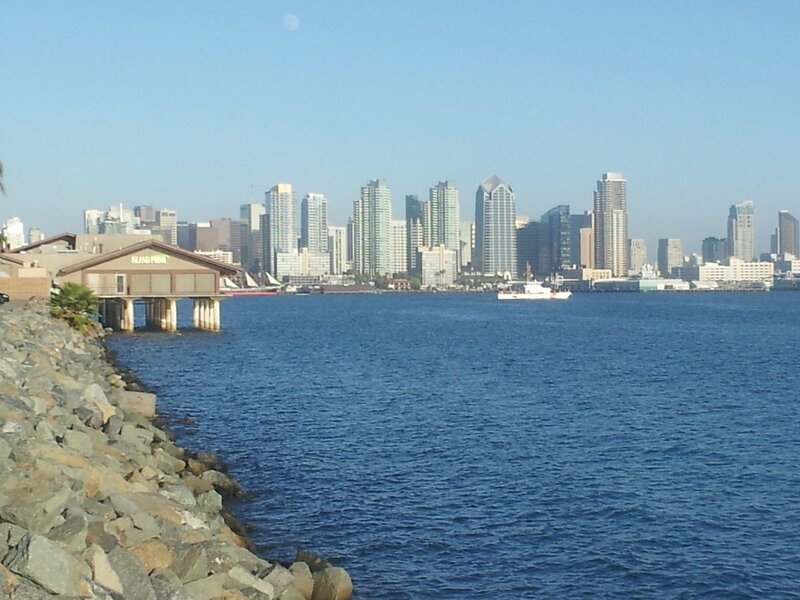 It also helps that there are so many terrific places to run in San Diego! 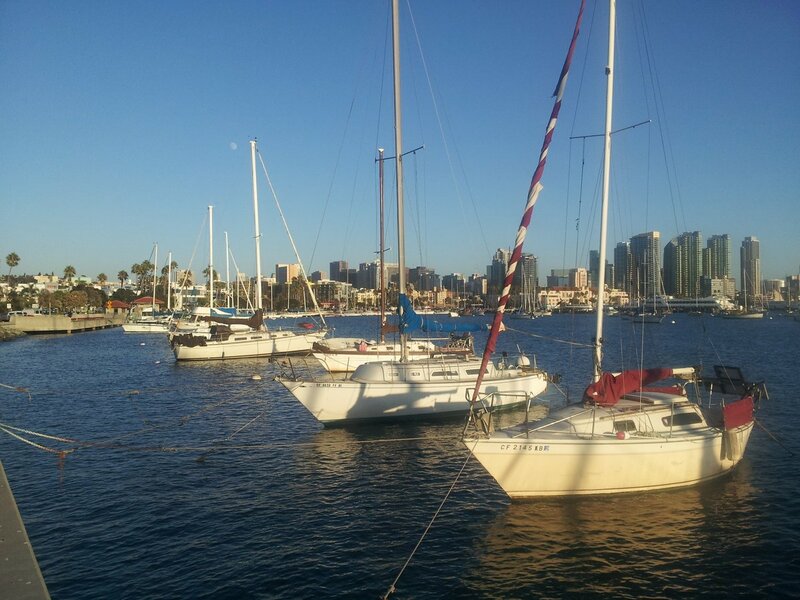 The three pictures here were taken on an eight mile run this week along the San Diego Harbor. 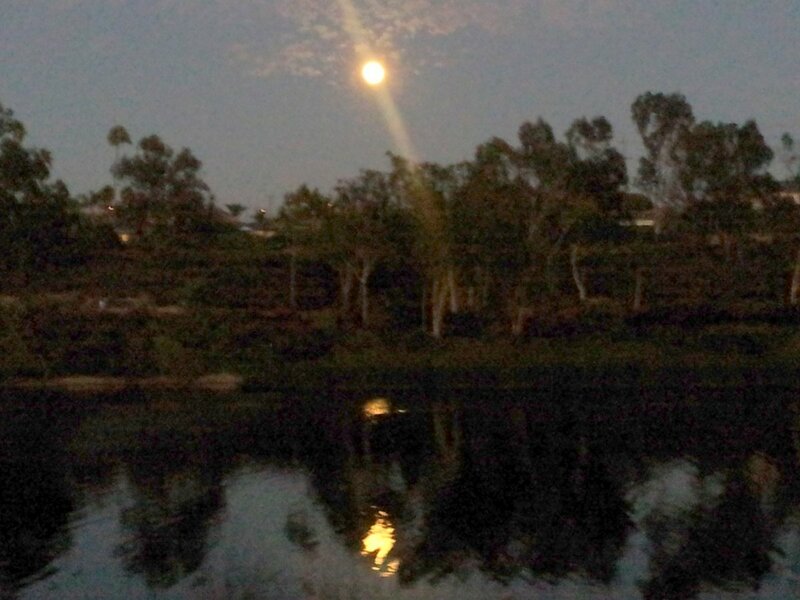 I love that the moon was there in all three pictures! I’m feeling terrific at this point, unfortunately I’m not completely confident I’ll achieve my goal pace of 10 minute per mile. The last long training run that I was able to keep at the 10 minute per mile pace was a 14 mile run at the end of July. I’ve been faster again after the vacation break, but still closer to 10:30 minute miles on my last long run of 17 miles. My shorter runs have been much better, and I’ve been pushing myself on these runs to improve my speed. However, at this point I’m concerned I will run out of training time and not be where I need to be on time. Since this is my first and probably my last marathon I’m really pushing to achieve all my goals. If I don’t finish I will definitely be running another marathon, but I don’t think I will run again if I have a respectable time, but miss my original time goal. My plan for the next 5 weeks of training is to make that decision unnecessary. So I will be pushing myself on every run. I’ll be doing everything possible to lose another 10 pounds. I’ll be sitting in the jetted tub every night to ease the sore knees and Achilles tendons. I’ll take ibuprofen and gluocosamine on a regular schedule too. Regardless of what happens, I want to know that I did everything possible in this final push to get ready for this race. Here is my final push – updated plan for the remaining 6 training weeks. 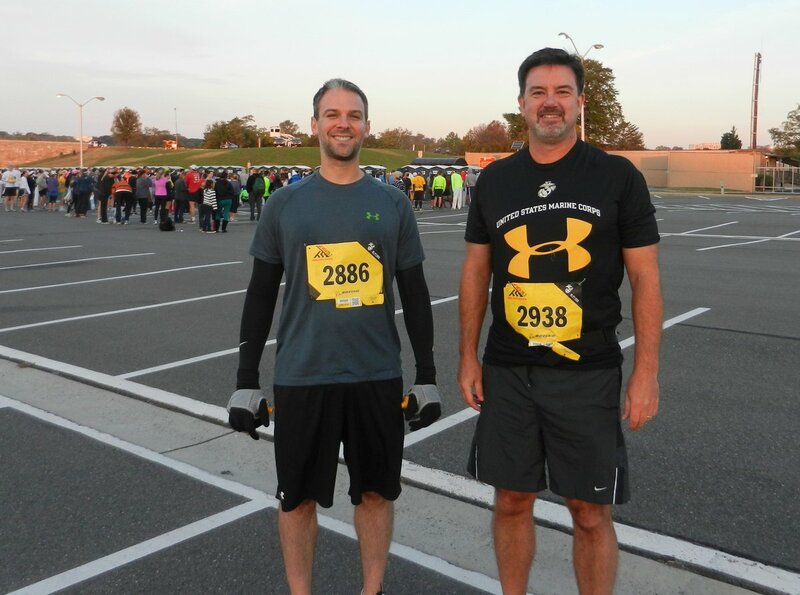 This post will describe my training plan for the 2013 Marine Corps Marathon. This will be the first Marathon I’ve ever run and I will be less than a month from my 53rd birthday on race day. The farthest I’ve run up to this point is 13.1 miles, but that is about to change. Although this will be my training plan for this race, it may not “work for everyone”. I’m am in pretty good shape, but currently in a slightly “over-trained” condition and slightly overweight for running weekly 16-20 mile runs. My legs and feet NEED me to lose weight to make this work. So this plan is tailored to deal with my specific situation. It is unlikely that I would follow this same plan if I ever run a second marathon. The point of this post is to create a plan to follow for the next four months. I’ve run 3 half marathons in preparation for the Marine Corps Marathon. I ran 2:31:00 in the first one, 2:03:19 for the second one, and 2:06:04 for the last one. This seemed like a good plan at the beginning. 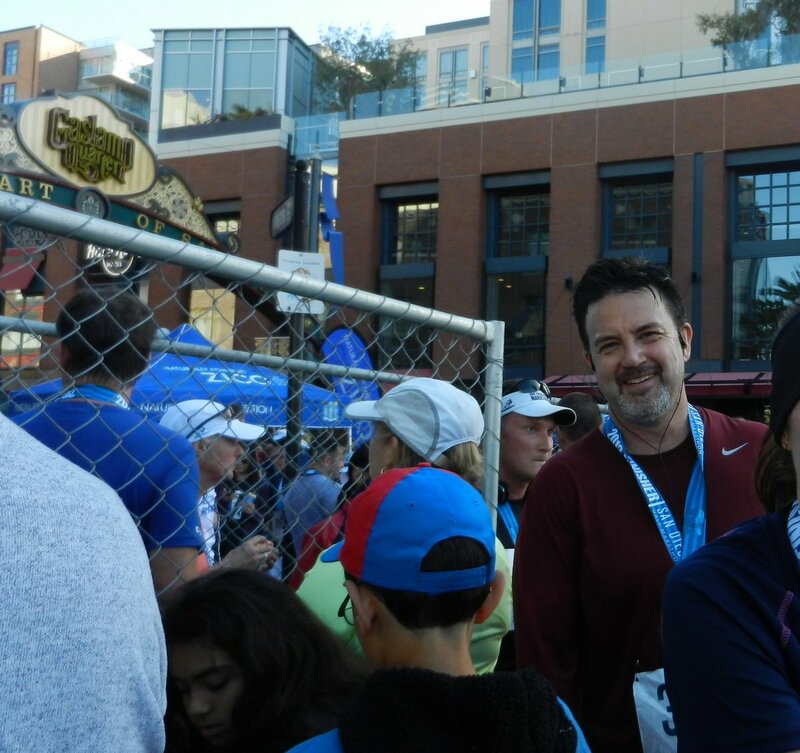 I felt great after the second half marathon when I added the 3rd half marathon to my schedule. But now about a week before starting full blown training for the Marine Corps Marathon I realize it was too much, I’m experiencing over-training issues. Both of my Achilles tendons are tender and have sore bumps about halfway up. My shins are sore. I think this happened because I added gel wedges to my shoes to try to help out my Achilles tendons while training for the last half marathon. I’m also more cramp and injury prone. A calf cramp during a training run a few months ago caused me to stop training for several weeks. All of this has actually lead to a reduction in my conditioning since February. I believe I would have been better prepared for the training to come if I had not run the third half marathon. In order to overcome the soreness I’m planning to change up my normal training pattern and add more cross training. For the half marathons my plan was to run three times a week, one short distance, one middle distance, and one long run. I will still run one long run a week, I don’t think there is a substitute for that, but I’m going to change it up for the other two runs. For the short run, the goal is improving speed, so I will mix in wind sprints at the beginning, then add 1 mile runs with plenty of stretching in the middle of the 16 weeks, and go back to a traditional short run at the end. For the intermediate length run I will substitute a two-a-day at the gym with at least 30 minutes on the elliptical for each visit for a total of 60 minutes of aerobic work, and then go back to running if/when the soreness goes away. To ensure I stay focused on losing weight I will go to the gym on most days I don’t run. Hopefully the soreness will ease up and I can move to a more typical training plan as the marathon gets closer. I’m a little concerned that I won’t be running enough to achieve my goal of 10 minute miles for the marathon, so I may adjust the training plan if I start to feel less sore. If the soreness continues, I’ll change my goal to finishing the marathon! I’ve been working on this for a long time so I hope this revised plan works and I my conditioning improves over the next four months. My next post for this series should be after the Marine Corps Marathon although I will continue to update my MCM Training Log page. Update 8/9/2013: I went on vacation to Sequoia and to Idaho for a couple weeks before I started training. All together I had about a month break. The month off got me past my “overtrained” issues so I’m following a much more traditional training plan. Week one started on 14 July, but I didn’t start until 28 July. My son pushed me to increase my Sunday mileage a little more than I expected, but it has gone fine. I’m well ahead of schedule and feeling great. I’m in week 5 and will run over 30 miles this week. So far so good! 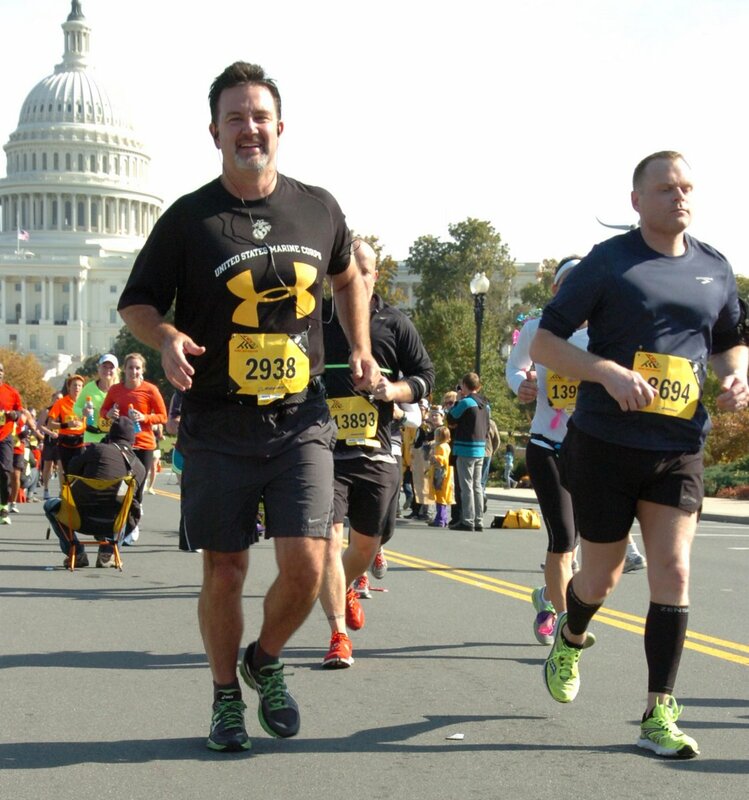 Update 29 Oct 2013: The Marine Corps Marathon 2014 registration will be by lottery! The lottery will start accepting entries on 19 February 2014 and end on March 15th 2014. This will be a much fairer system than they have been using for the past few years. So my suggestions below for getting in under the old system will thankfully not be necessary. There are other ways to get in besides the lottery… an automatic entry is available to anyone completing the Marine Corps 17.75K run, there will still be charity spots available, and if you’ve run at least 5 previous Marine Corps Marathons you are guaranteed another race if you sign up for the MCM Running Club. I’ve been planning on running the Marine Corps Marathon 2013 since March 2012. I’ve run hundreds of miles to train and finished two half marathons, but the toughest day of the last year was 27 March 2013, the Marine Corps Marathon Registration day. I clicked the Register button at 0900 and immediately got a server error page. I probably clicked the register button along with thousands of others at almost exactly the same time. Fifteen or twenty minutes later I got to the registration page… sort of. However, there were only 3 fields, no labels for the fields and no visible buttons. The Active.com registration page was obviously going to have major problems! I kept trying, this was a bucket list thing for me. I managed to get logged in after a few tries and eventually got to a registration page. However, ultimately even though I started the process at the moment registration opened I did not get a spot for the 2013 Marine Corps Marathon during the Active.com open registration period. What a mess! This website obviously has design issues, they aren’t able to handle popular events that sell out quickly. Although I think it is possible to design a website that can handle this kind of surge traffic with ease (think Ticketmaster) or at least handle it much better than they did, I’m not sure a first come, first served approach is the best way to select who gets to run. If there are going to be 15,000 people who all try to click the Register button at the same time in order to get 7,000 spots, then this is definitely not a fair way to distribute the spots. A lottery is a much more fair way to do this. Have the individuals or teams submit applications in advance of a cut-off day. Hold a random selection process and notify those who are selected, and let the others know they have not been selected. I’ve done other events that have lottery selection (Mount Whitney), not been selected, and at least felt the process worked as intended. This did not feel fair, did not feel professional, and I’m sure there are a lot of ticked off people! With a random drawing there will be disapointed people, but that is better than ticked off people. Although I did not “get in” via the Active.com Marine Corps Marathon registration, I didn’t give up. This is a bucket list thing for me, and I’m not getting any younger! I knew there was a possibility to get registered via authorized charity organization. 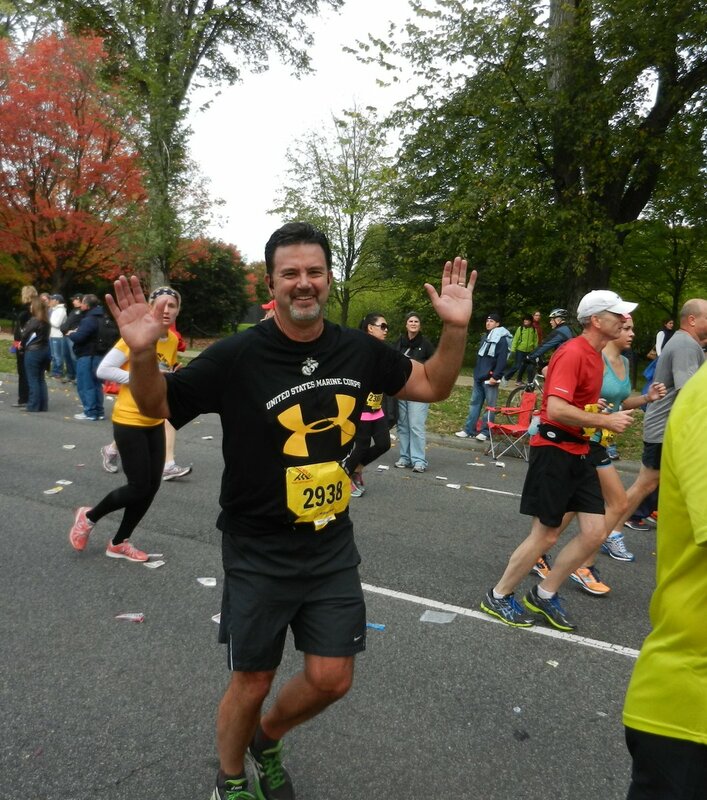 Although I could not find a prominent link on the Marine Corps Marathon page I did a search and found a page that had the answer to my problem. They have a MCM Charity Partners page. The Marine Corps Marathon has set aside registrations for these organizations that are available to anyone but require a minimum donation pledge. I went with the charity Finish for Kids, they are doing good things, have a well working website, and have a reasonable donation minimum. Although I’m almost certain the Marine Corps Marathon will make significant changes to the registration process following this debacle, here are a couple things that might help if they don’t. Be sure to be logged in to Active.com before the event opens for registration. Logging in later could cost you time, and that could cost you a bib! Don’t close your browser window, just keep refreshing, this could preserve you a place in line. Although the site was so tragically messed up this year I’m not sure that would help. If the site says “try back in a few minutes” don’t wait a few minutes, hit refresh. Beyond that the only hope we have is that they change the process. Since I got in this year via a Charity team, I’m hoping that I will achieve my goal to finish, as well as my time goal. If not I’ll be back at this again next year. I’ve completed 2 half marathons since I started planning for the Marine Corps Marathon 2013. My early planning and research started in March 2012. I had just decided to do a Marathon, and my first post was really about making the decision, thinking about what it would take to go from my average run distance of 3-5 miles to running 26.2 miles. The next post focused more on what it would take to sign up for the Marine Corps Marathon, actually more complicated than I thought as this is a very, very popular race. It also covered a more serious look at some training plans and training advice for “older runners”. Although there have been some glitches in the system, including a 5 week gap in training for my first half marathon due to a back injury, I’ve followed the original plan fairly closely. I have made adjustments to the “published plans” due to my age. Most of those call for running 4 days a week. I run 3 days a week when I’m in serious training. I run a shorter run at the beginning of the week, then add a couple miles 2-3 days later, and do a long run on Sunday. If I get sore I stretch, get on the elliptical in the gym to work out the soreness, and get in a hot tub to help with my biggest issue tight muscles. My first half marathon result was OK, but I did not achieve my goal for the Americas Finest City Half Marathon last August. 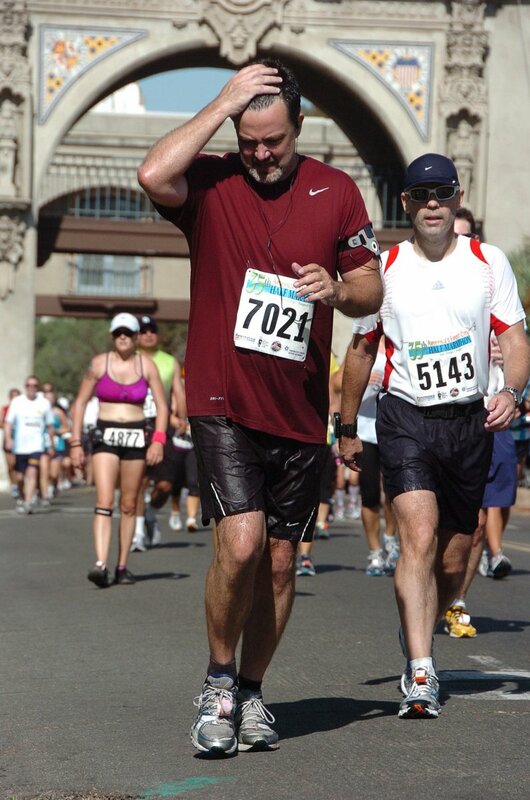 Part of the problem was the unusual heat… I was not the only one dripping sweat on this race. The other issue was my training plan, not enough long runs and no hills during training. 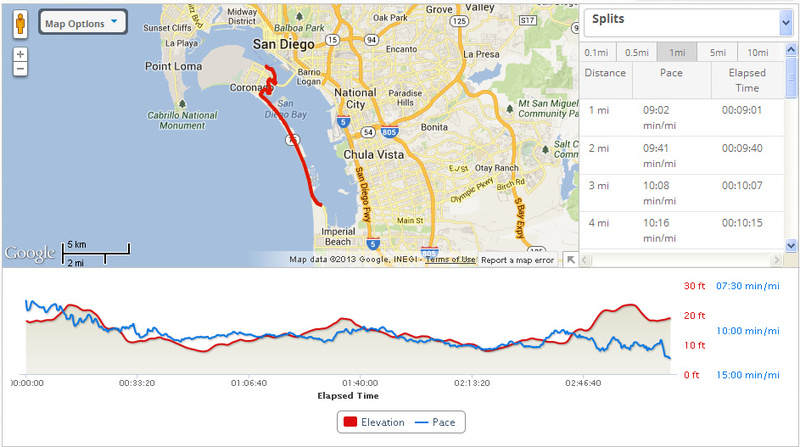 So I adjust my training plan to ensure I had more long runs before the San Diego Half Marathon, and to make sure I ran plenty of hills, not all flat training runs. I recorded those training runs on a new MCM Training Log page (transitioned to a post after the marathon) to keep me honest, and so that I could see how well the training adjustments would work. I have started a new table at the top of the page to record the training runs for my next race. The adjustments to my training plan and the training log both worked better than I expected. Even though I was sick with a cold on the day of the San Diego Half Marathon, I exceeded my goal easily and had my best pace on a long run with or without a hill. With a goal of 10 minute miles and a result of 9:25 minute miles, I felt good about my training plan, and it started me thinking more aggressively about my goals for the next half marathon and the Marine Corps Marathon. But to have more aggressive goals, I’ll need more a more aggressive training plan. 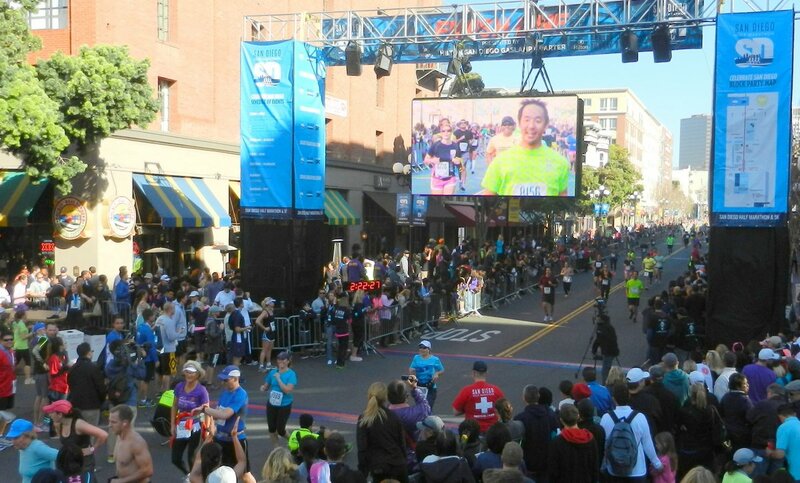 The Rock and Roll Half Marathon – San Diego on 2 June 2013 will actually have very few uphill sections and finishes lower than it starts. This will help me get a personal best, but it may not be a good test for the Marine Corps Marathon. I’ll have nearly 5 months after that race to train for the Marine Corps Marathon. This is almost too long for an old guy like me to keep running weekly runs between 10 and 20 miles. So I need a good plan to train and recover multiple times during that 4 months. So I’ll divide that time into 2-3 different training cycles of about 6 weeks with time (1-2 weeks) to recover in between the training cycles. So possibly a build up to 16 mile long runs in the first cycle, 18 in the second, and 20 in the third. Of course plenty of stretching and soaking in the hot tub will help keep me loose and hopefully injury free. Finally, it is time to get serious about losing 15-20 pounds. I expected my weight to drop when I started running 20 miles a week, but it has not dropped at all, not 1 pound. Nothing magical here, I just need to eat less, and more health foods. Less sugar, less fat, more fruits and vegetables! I don’t think my legs will be happy with 15-20 mile runs at 215 pounds. They may not be ecstatic about 195 either, but they will be happier! OK, it’s time to put it out there! What are my goals? 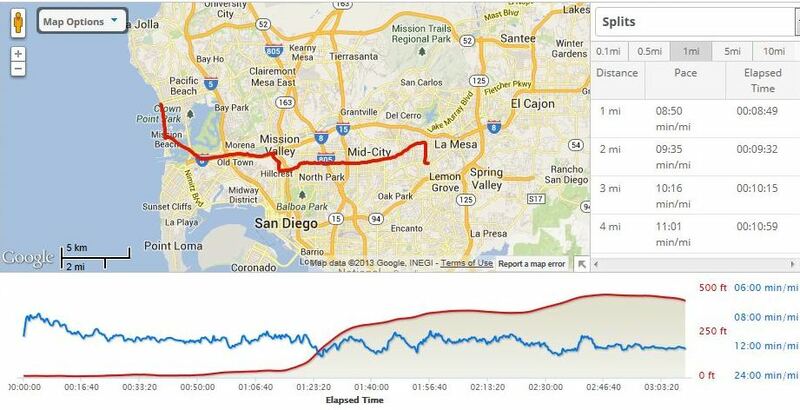 San Diego Half Marathon: average of 9 minute miles and well under 2 hours. 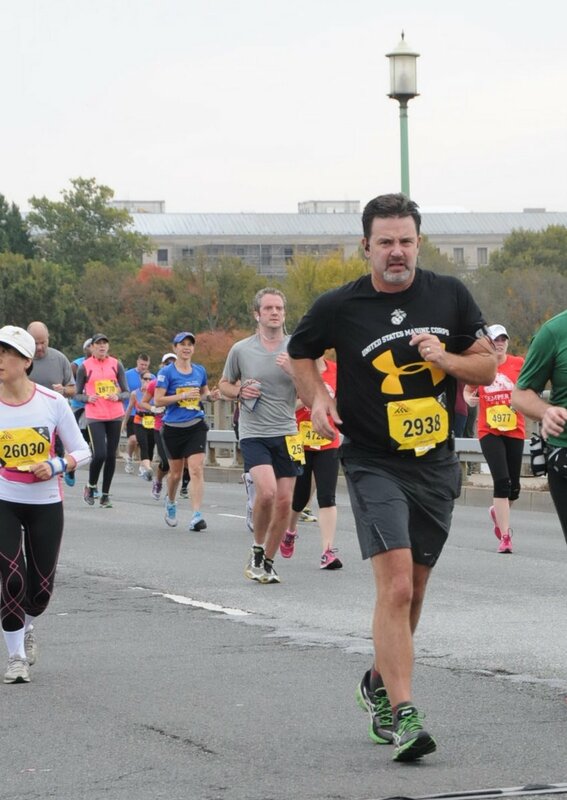 Marine Corps Marathon: Nothing novel here, I just want to beat Oprah’s time! She ran the Marine Corps Marathon in 4:29:15 with 10:16 minute miles. So my goal… 10 minute miles and around 4:20. Not going to start this post with excuses this time. However, I was very concerned when I woke up the day before the half marathon with a sore throat, head congestion and several other classic common cold symptoms. I had hints of a cold coming on for a couple weeks, but I thought my system had fought it off. At least with one day of warning I could try out a few cold medicines to see which one would work the best for a 13.1 mile run. I needed the congestion to go away, the breathing to be clear, and hopefully not be too dried out. I decided to take a Mucinex to clear the congestion I could feel in my bronchial tubes. It was a pretty mild choice. I figured the aches and pains from the cold would just blend in to the new ones from the run. I had a time goal for this race, 2:10 with a 10 minute mile pace, but the time goal was not as important as this half marathon being a motivator to keep running long runs and prepare myself for even longer runs this summer in preparation for the Marine Corps Marathon in October. So I told myself that it would not be the end of the world if I didn’t achieve my time goal. The conditions were nearly perfect for the run. The temperatures were in the low fifties at the start, but there was no wind and the sun was shining. Heat was not going to be a problem with this race like it had been with the Americas Finest City (AFC) Half Marathon in August of 2012. There was one big hill about 8.5 miles into the run, but the course was flat to that point. The finish was mostly down hill which helped me pick it up and take it in. The race was well coordinated and the start was very well controlled, with 15 waves starting 1:45 minutes apart, which gave the next wave just time to move up to the line. In the AFC Half there was basically a mob start and the course felt very crowded for the first 2 miles. For this race the course had plenty of maneuvering space at the beginning and I was able to get out to a fast pace (for me) for the first 5K. I settled in to a pace that I could sustain for entire race over the next 5 miles. Running by MCRD San Diego’s entrance gave me a nice mental boost right before the uphill portion of the course started. The Washington Street hill is a gradual, but long climb with the last section climbing steeper. I was grateful for the lessons learned from my last race, I had mixed hills into my short and long runs while preparing for this race, so I was able to maintain a reasonable pace up the hill and quickly recovered my regular pace once I made the top of the hill. Although I was happy with my pace up the hill one older lady 60+ ran by me like I was walking. I thought I might catch her on the flat, but she was gone! 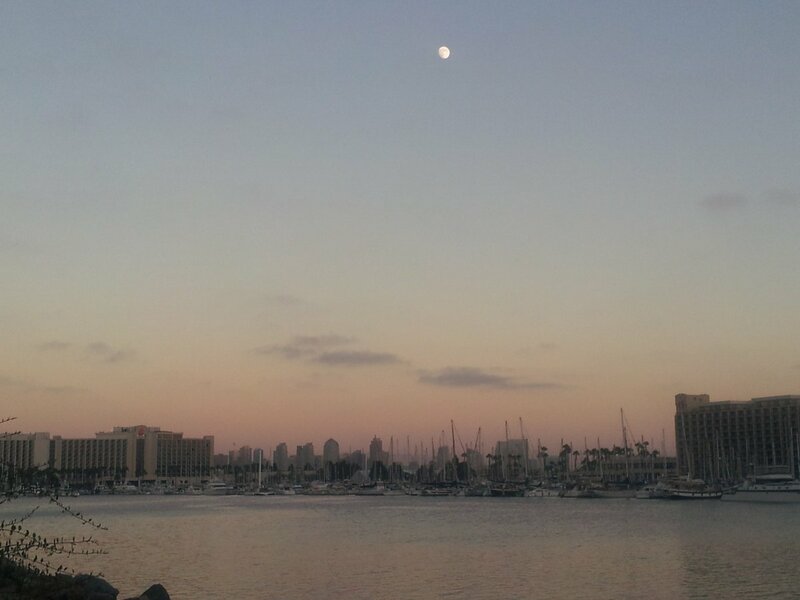 As we ran past the western edge of Balboa Park, the city and finish started to seem to be pretty close. About a mile from the finish a heavy metal song came on my IPod during a nice downhill, which gave me the push I needed to just let it all out and try for good strong finish. My average pace for the AFC Half Marathon, my first, was 11:31 minute miles. With better training and better conditions I was able to trim more than 2 minutes off my per mile pace. I finished in 2:03:19 with an average pace of 9:25 minute miles. I had beat my goal time by nearly 7 minutes! 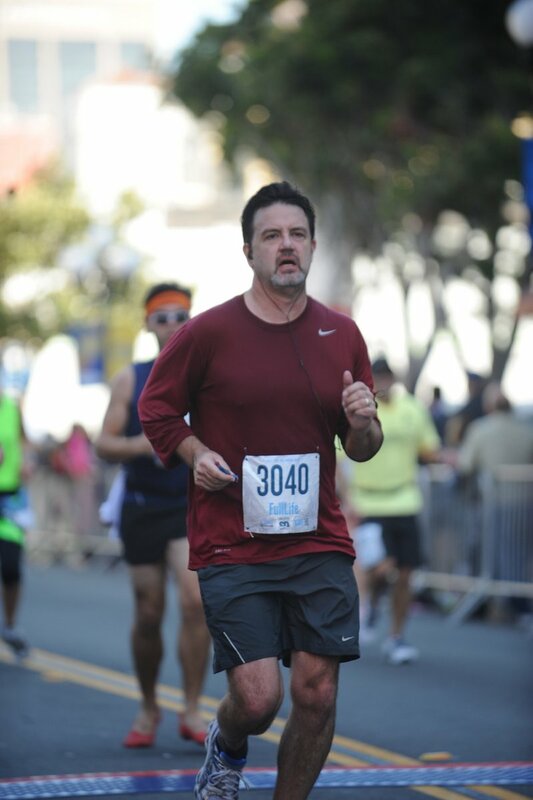 I also had much more energy left over after this race, and the possibility of successfully running the Marine Corps Marathon in October seems much more realistic. If I train smart, put in the miles, and stay healthy, and I’m fairly confident I will make it happen. Coming across the finish line! Leaving the finish line area after the race, feeling pretty good about the run, but no idea what my time was at this point. 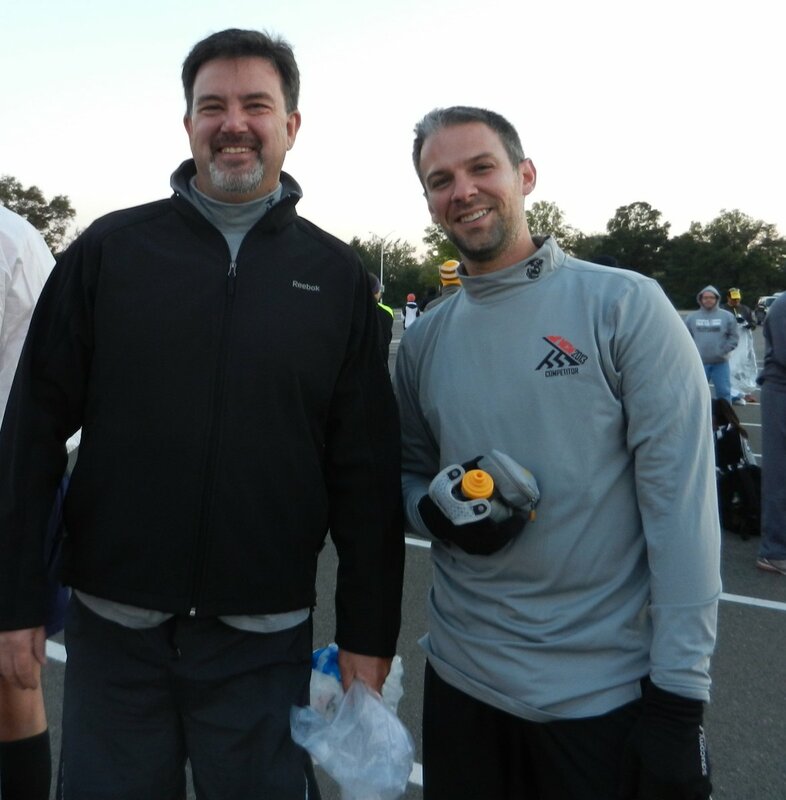 Here are a few more pictures from the race… definitely dealing with a congested head and headache by the expressions in these pictures. New goal next race… smile for the camera! And I guess run under 2 hours, why not. 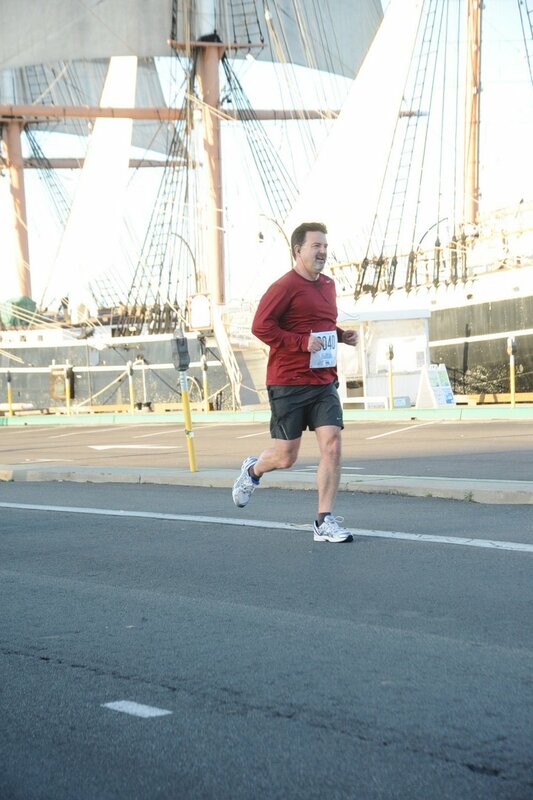 Running past the San Diego Maritime Museum, about 2 miles in. I’ve left most of the wave I started with behind and catching up with the next wave. When I signed up I guess I put 2:20 as my expected time. I did a bit better than that. Running near the harbor a few miles into the race. Leaving Liberty Station already past the 10K mark. Beyond the top of Washington Street, mostly downhill from here. The 2013 Marine Corps Marathon is in a little over a year away. So far I’ve trained for and run in one half marathon. That experience helped me learn several lessons that I will use to modify my training plan. My original plan was to rely on less running and more low impact aerobics. I took this approach due to my age. I’m currently 51, however I will be nearly 53 when I run the Marine Corps Marathon! This will be my first and maybe my only marathon so I want to be ready and to finish. 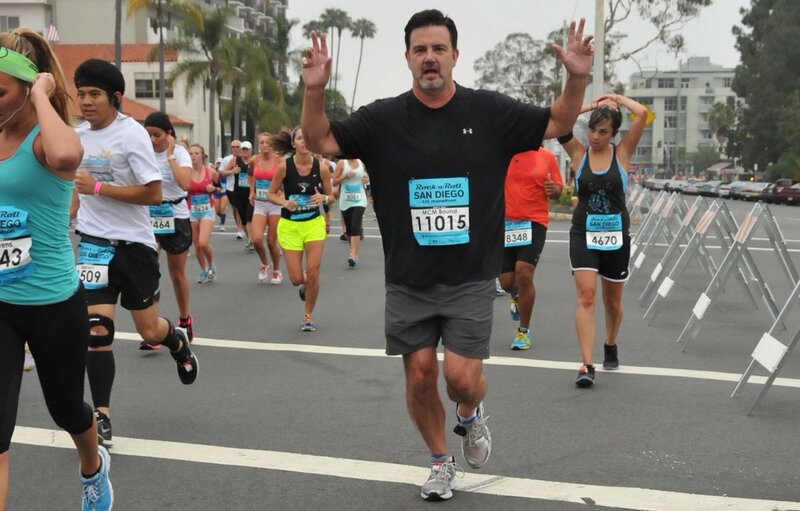 On August 19th 2012 I ran my first half marathon, the America’s Finest City (AFC) Half Marathon in San Diego. I was not satisfied with my performance in that half marathon, and I definitely could not have run twice as far on that day. This should not surprise me because I was training for a half marathon, and pretty light training even for that. The original plan was to run one more half marathon next year in March and then run the Marine Corps Marathon in October 2013. Based on the way I felt at the end of my first half marathon, I decided to add another half marathon to my training plan. 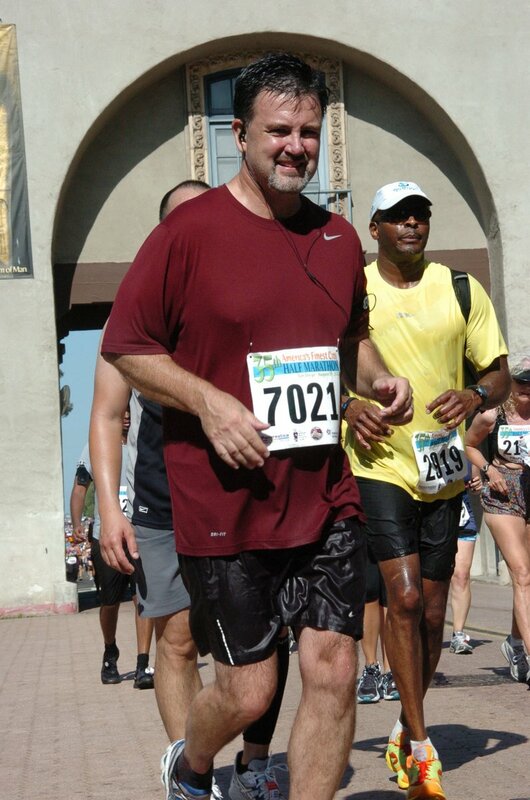 So I have signed up for the San Diego Half Marathon on March 10, 2013 and the Rock and Rock Half Marathon in San Diego on June 2, 2013. This will ensure that I have an additional intermediate goal, and that I don’t have 7 months between races. 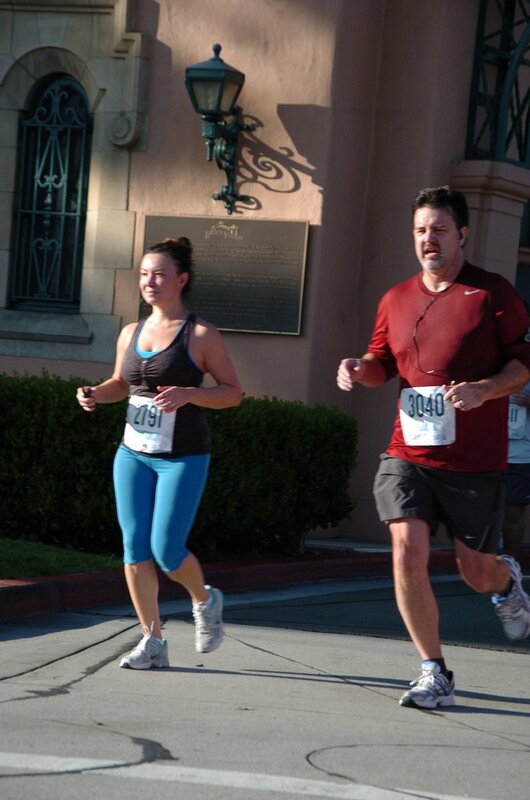 The San Diego Half Marathon is 17 days before the planned sign-up date for the Marine Corps Marathon on March 27, 2013. 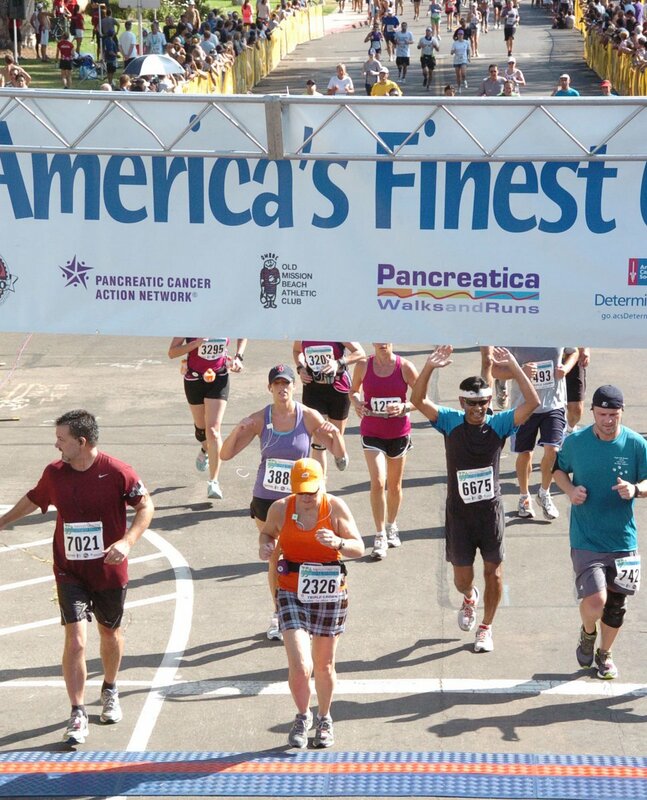 This race will be my last chance to reassure myself that I will be able to run a full marathon before I sign-up. For that reason I plan to train for a 20 mile run, not a half marathon. 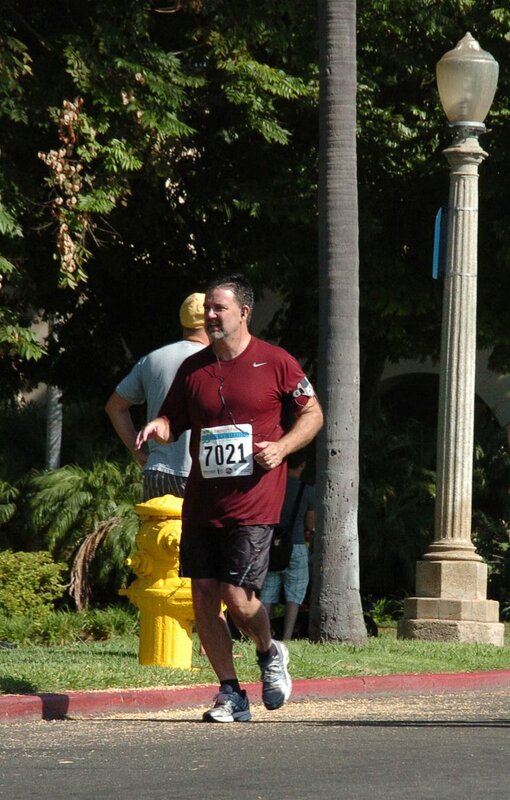 I want to have some energy left at the end of the half marathon… something I did not have at the end of my first one. So I will be running longer training runs, not long enough to prepare for a full marathon, but long enough to get a better idea of my ability to train for races longer than half marathons. 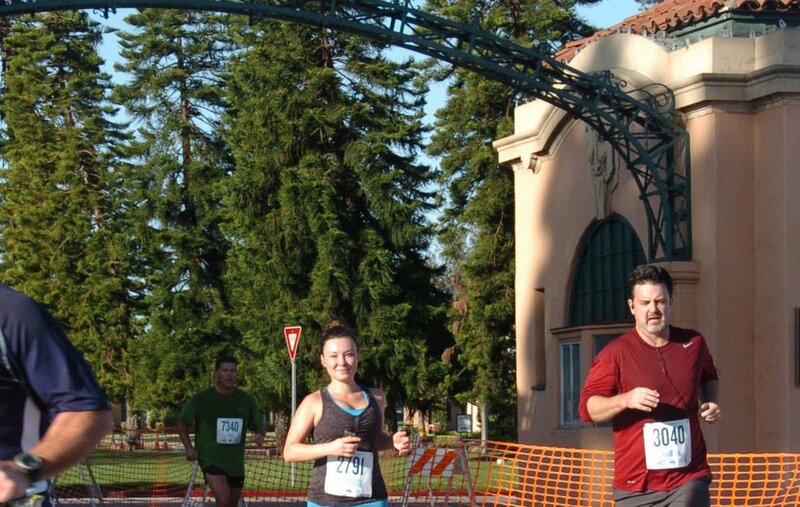 There were two other lessons I learned in my first half marathon. First, the weather may not cooperate. It may rain. It may be unseasonably warm, or cold. You have to be prepared for unexpected conditions. I also learned that I have to run hills! All of my training runs were on flat courses, but the half marathon had a fairly significant hill about 3 miles from the finish. I was not prepared for that hill and I really have no excuses. I live in a very hilly location, and work in one too! I love running at the beach or at the lake near my home, but that is not the only kind of runs I need. I’ve already done one hill run near my home. It felt good, and I’m sure this type of run will help me prepare for a better time on my next race. An issue that I anticipated in my original plan was that injury would be a huge set back to training and should be avoided. Unfortunately, I did not avoid injury while training for the AFC Half Marathon. I did not stretch as much as I planned, and my legs, especially my hamstrings go too tight. I was also too aggressive in my weight training. The hamstring tightness combined with aggressive weight training led to a back injury and a 5 week break in my training. I have to stick to my plan to stretch regularly, and moderate my weight lifting. I will still train with weights, but I will train with lower weight and more repetitions to help avoid injury. I will admit that during the last couple of miles of the America’s Finest City Half Marathon I started to wonder if I would be able to ever finish a full marathon. I questioned my sanity, not only planning to run a marathon, but writing about it in my blog. I have not forgotten how I felt. 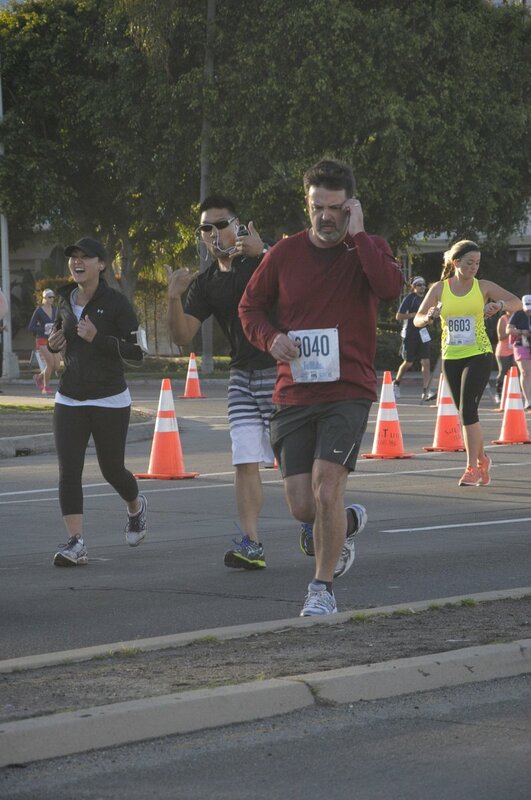 I was tired, out of gas, pretty much done at the end of that race. I have put aside those doubts for now. Will I be able to finish the Marine Corps Marathon? I would not bet the farm on it… I only bet on sure things. However, I will approach the task with a realistic attitude about what it will take to succeed and a determination to make it happen.